Cheddars produced in the traditional way usually weigh 25kg. 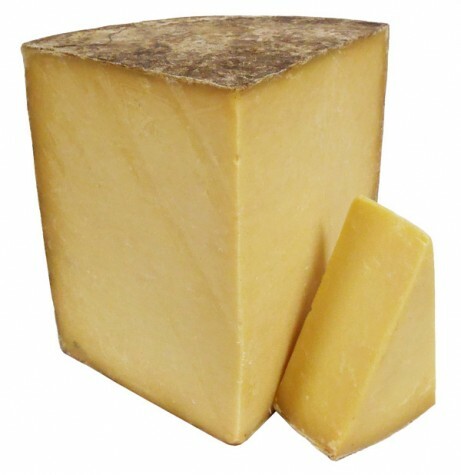 The first stage of making cheddar includes the introduction of starters and rennet to milk to create the curd. Once set the curds are cut, stirred and heated in their whey between temperatures of 38 and 40degrees, this process is known as scalding the curds. After an hour the whey is drained and the curds are cut into large blocks. These blocks are stacked, flipped and re-stacked in small towers for an hour or more, this process is known as cheddaring and is crucial to remove individual curd particles. The next process involves milling the curd into walnut size pieces and then adding coarse salt followed by draining the last of the whey off preparing for hooping. Large hoops are lined with damp muslin cheesecloth and filled with the curds, the hooped cheeses are stacked and pressed for several hours under strong pressure. Next the cheese is turned, briefly dipped in hot water and pressed again overnight. Lastly the pressed cheeses are re-dressed with two layers of cheese cloth and smeared with lard before being left to mature for a minimum of eight months in humid maturation rooms. During maturation the cheeses are hand turned every few weeks to ensure they ripen evenly.